Guns, cannons, pythons… there’s numerous nicknames for gigantic arms. If you are a real lifter, you know as well as I do that these nicknames not only apply to the biceps, but to the triceps as well. A real bodybuilder knows that the three heads of the triceps is what comprises two-thirds of the upper arm. Triceps are the primary pushing muscles of the upper arm. They assist on press of the upper body, barbell bench press of angle, flat, incline, or decline, dumbbell bench press, shoulder presses of variety… these lifts are all assisted via the tris. excellence. This workout will help you build those tris to a size that you and all of your friends at the gym will be in awe of. You do not want to waste time in between sets with this routine. Get in, get warmed up with a few minutes on the treadmill or elliptical, get loosened up and go hit it. Efficiency in the gym is key to success with physique development. You also want to make sure that when you are in the gym, you are working hard. If the weight is light, make it heavier. If three seconds is not enough for you to lower the weight, go for four. Strive for constant improvement every single workout. About one hour before training, eat a small meal containing about 30 grams of protein and 50-60 grams of carbohydrates. The protein can be egg whites, steak, chicken, or a whey protein shake. The carbs can be whole grain bread, oats, or a small fruit. Drink some water with this meal. 12-16 ounces should be good. Thirty minutes before leaving for the gym, consume a pre-workout nitric oxide drink. Drink it slow so it has time to work before you begin lifting. 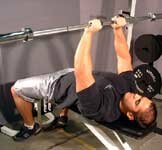 This exercise begins off just such as a average flat barbell bench press, only your grip is going to be closer. You want your hands to be anywhere from six inches to shoulder width apart. If your hands are closer than six inches, it will place extra stress on the wrist and elbows. If your hands are past shoulder width, the chest will bear the majority of the load. Lower the bar to a three count until it touches your chest. Once it does, explode up to a count of one. Squeeze the triceps at the top for a count of one and repeat. Do two warm-up sets and then do four heavy sets of 10-15 reps with about one minute rest between sets. Lie on a flat bench with an EZ Curl Bar in your hands at arms length. Keep the hands about six inches apart for the best stimulation of the tris. If you have elbow problems and can not perform these comfortably, you can do them with dumbbells. Hold them with the palms facing each other and perform the exercise as you would with the bar. Start out with your hands on the bars or handles if provided and have yourself pushed up to arms length. Bending at the elbows, lower yourself down until your upper arms are parallel to the floor or your arm is bent to a 90 degree angle. Lower yourself to a three count and push yourself up to a one count. Squeeze at the top of the movement. If your body isnt enough weight, you can add weight via either a vest or a weight hanging from a belt. Do three heavy sets of 10-15 reps with one minute rest in between. 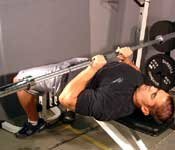 You can also do bench dips via placing two flat benches side via side. Place your feet on one and place your hands on the other and hold yourself up. Lower yourself until your arms make a 90 degree angle and push yourself up. 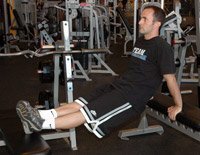 Add weight to this lift via placing weight on your lap. Stand at a cable station with a rope hanging from a high pulley. Grab the rope with your palms facing each other. Keeping your upper arms to your side, bend at the elbows and lower the rope until your arms reach full extension. Squeeze for a count of one and then let the rope back up to the beginning to a count of three. Repeat. Perform two moderately heavy sets of 20 reps with about one minute between sets. To keep the blood pumping into your tris and to keep the muscles warm, flex and stretch the triceps in between sets. This is crucial in helping your muscles both recover and prepare for the training and also helps to prevent injury. After your workout, flex and stretch a little more and make sure you get some protein and carbs in within 30 minutes of training. Without nutritional support, your triceps, as well as the rest of the body, won’t develop properly. onsume a meal thats about 30-40 grams of protein, 60-80 grams of carbs, as well as about 12-16 ounces of water. Other good supplements for recovery include creatine, vitamin C, as well as Branched Chain Amino Acids.